As a self-described hater of change, I knew this book by author Kristen Strong would be a wise choice for me. I am a girl who digs in her heals when change is in the air. I loathe a departure from things familiar. Girl Meets Change is such an encouraging read for anyone who has ever endured change, drastic or small. And because the seasons change….this book is a great read for all of us. 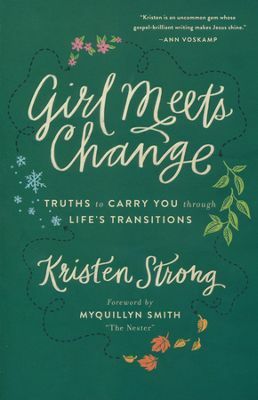 What I love about Girl Meets Change is the way Kristen ties in her own personal stories and accounts from people she has known, as well as truth for the God’s word. This book is not just a personal account full of examples of how she endured and coped with change. It is also a guide to what the Bible has to say to us about life and how we can apply it to our own personal situations. If I had to pick my favorite quote from this book, it would be, “I can’t wring my hands if I am holding something in them.” Kristen so gently reminds us that we need to spend some time in the Good Book before ever getting on Facebook. She goes on to say that the distractions of this life are not going away. We have to carve out time for what is most important. Girl Meets Change is an easy five starts. I was given a complimentary copy of this book by its publisher in exchange for my honest opinion. Check out more from Kristen Strong on her blog, Chasing Blue Skies.